During the summer Caledonia’s assistant travel manager Caron went on a walking holiday in Northern Spain and explored the city of San Sebastian. 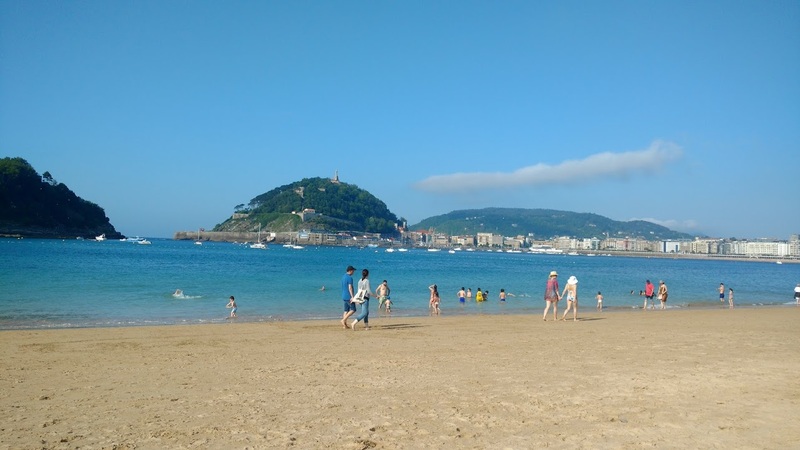 In this post, she tells us about her experience and why San Sebastian and the Basque Country are well worth a visit. Think of three things related to Spain. 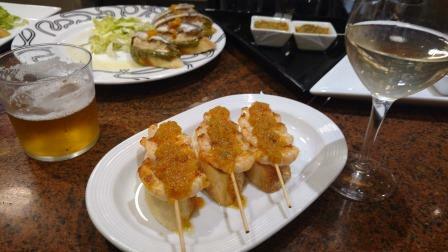 Flamenco, tapas and beach resorts would be a typical answer. Northern Spain, however, often overlooked by the average tourist, breaks Spanish stereotypes by offering a completely different holiday experience. Okay, so perhaps the North can’t guarantee sunshine everyday but what it lacks in sunshine it makes up for the warmth of its people, dramatic coastlines and a second-to-none culinary experience. After my first full day of walking along the rugged Spanish coastline, I reached the first major city of the Basque Country – San Sebastian. This chic coastal city used to host the Spanish royal family every summer in late 19th and early 20th century and it’s easy to see why. The wide, elegant promenade, stretching the length of the city to the imposing sculptures of ‘Peine del Viento’, frames the beautiful beaches of La Concha and Ondaretta – a view nobody can resist! Having gone for a dip to revive tired legs, I admired the Miramar Palace and island of Santa Clara from the water. With the sun beating down, the beaches were busy but without the tightly packed rows of sun loungers you could expect to find on one of the holiday resorts of the Spanish Costas. After checking into accommodation, the search for food began. San Sebastian has a stellar reputation in the culinary world and in fact is one of the cities holding the most Michelin starred restaurants per square metre in the world. Not looking to break the bank, I skipped the Michelin experience, deciding to bar hop and eat pintxos, the Basque version of tapas, instead. This is a great way to sample the top-notch gastronomy for a just few euros and a popular choice with visitors and locals alike. In the lively old town, the streets are lined with bars, each with a colourful selection of pintxos on display for the customers to enjoy and wash down with a glass of local cider or txakoli (pronounced ‘chak-o-lee’), a white wine produced in the Basque region. Delicious and certainly a ‘must’ for foodies visiting the area! Walking through the Basque Country, one of the things that struck me most is how green the landscape is – a stark comparison to dusty, dry Southern Spain. Basque people are an active bunch which is no surprise given the immense natural playground on their doorstep. Each day I was passed by runners, walkers and cyclists of all ages enjoying the outdoors. 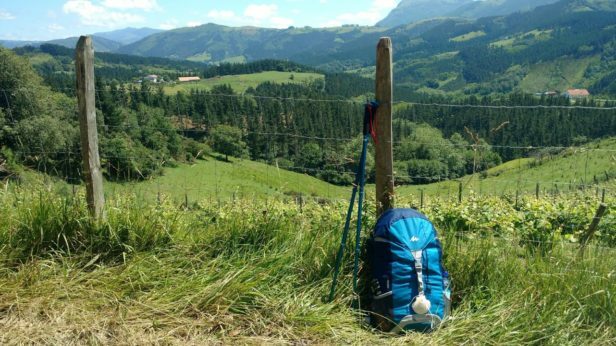 For those who like the idea of a holiday which combines elements of nature and city, there are many national walking routes running throughout the Basque Country making a full or half day hike very accessible. 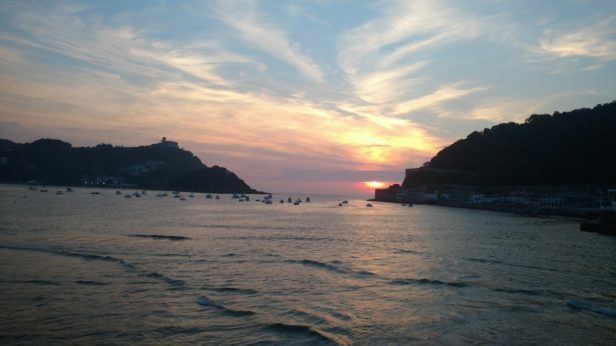 From San Sebastian you can enjoy walks along the coast to nearby port village of Pasajes de San Juan. Following on with the sport theme from land to sea, with the Cantabrian Sea lapping onto its shores, the Basque Country is also making waves in the world of surfing as a dream destination. The coastal town of Zarautz, just 20 km from San Sebastian is home to the Basque Country’s largest stretch of sandy beach and there are many surf schools offering classes and surf board rental. My trip through the Basque Country was an eye-opening experience demonstrating how diverse Spain as a country really is – culturally, culinary and visually – leaving me wanting to explore more. I can’t wait to return next year to continue my walk and discover what the other Northern regions have to offer! Caron Oag is a modern languages graduate with a background in tourism and Teaching English as a Foreign Language. She has worked in Spain and Germany and travelled widely throughout Europe as well as parts of North and Central America. With a passion for travel, adventure and language learning, she is always on the lookout for her next destination!